5th in a series, the other 4 attached. 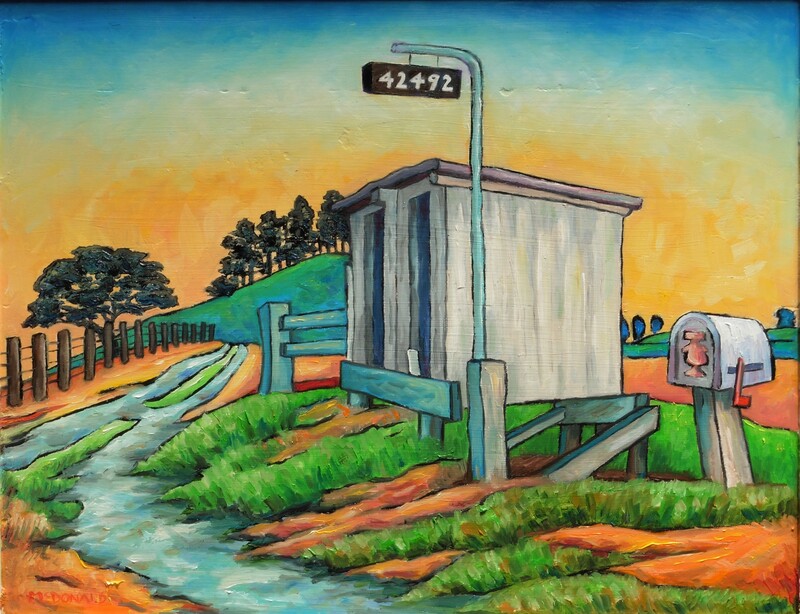 This image pushes the Kiwiana button it seems, a Taranaki dairy farm’s postbox (with Swiss eagle?) and delivery shed. It’s fascinating to see the variations and each one is fresh, I think that’s hard to do. Beautiful. I read that Monet did 250 (different) versions of his lilies, I’m nowhere near that but thank you! I think the idea of a subject being so fascinating and with so much depth requiring this kind of exploration, well, I like it, and I can see how rewarding it is to really know and explore. In the past I am not sure I would have understood it, always looking for variety, but as I am getting older I maybe am more contemplative? or see things I did not, before. I think it is great what you did here. It is good to see the old mail box, beautiful painting. Beautiful painting Alistair. I envy your stong lines and patterns. Well thought through composition also.